(0 Customer Reviews) | Write Review 11 issues per year LA RIVISTA MENSILE DEDICATA AL MONDO DEI MANAGER E DEI PROFESSIONISTI, MA ANCHE ALLE AZIENDE. UN MAGAZINE CHE VUOLE INFORMARE E METTERE IN EVIDENZE LE NUOVE REALTÀ DEL MANAGEMENT DI QUESTO SECOLO, CHE PONE AL CENTRO DEI PROPRI INTERESSI L’UOMO. LA RIVISTA MENSILE DEDICATA AL MONDO DEI MANAGER E DEI PROFESSIONISTI, MA ANCHE ALLE AZIENDE. UN MAGAZINE CHE VUOLE INFORMARE E METTERE IN EVIDENZE LE NUOVE REALTÀ DEL MANAGEMENT DI QUESTO SECOLO, CHE PONE AL CENTRO DEI PROPRI INTERESSI L’UOMO. 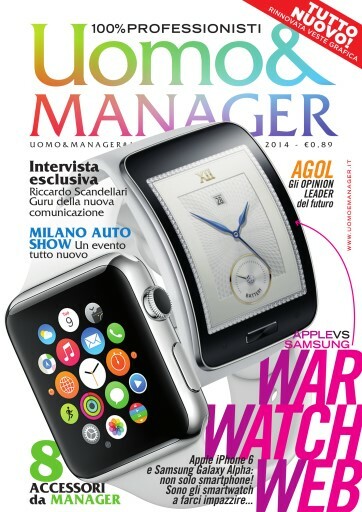 You'll receive 11 issues during a 1 year UOMO & MANAGER magazine subscription. You'll receive 11 issues during a 1 year UOMO & MANAGER magazine print subscription.